Microsoft Office 2010 isn’t due out until the 12th May and it will be some time more before it hits campus desktops. 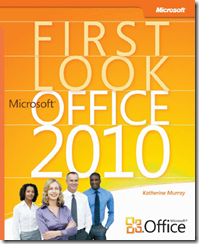 However, if you would like to get up to speed with the major changes in the new suite, the Microsoft Learning team have put together a free e-book, “First Look Microsoft Office 2010”. The book covers features which are directly relevant to education including broadcasting PowerPoint over the internet, and saving files ‘in the cloud’ via SkyDrive. over it’s 186 pages it talks you through some of the most significant enhancements in the Office suite. I’m impressed with the collaboration that Office 2010 encourages, and have got very used to doing things like broadcasting PowerPoint over the internet, and the options to save my files to my SkyDrive on the web, rather than on my local hard disk.